Trump had responded to reports Friday that his administration proposed releasing immigrant detainees to sanctuary cities by not only confirming the plan, but saying it remains under strong consideration. Further, the president tweeted that relocating illegal immigrants to these districts should make the "Radical Left" happy. Once released into the US, they are here to stay. The 9th Circuit vacated the ruling by the District judge and ruled that we can. The fact that Dems are crying out over this only shows their real agenda. They don't give a damn about these people, they just want them to flood red states and counties to tip the election vote in their favor and cement Democrat Marxist control. This is just an outstanding political move by our President. I was thinkin...why would Bernie say that? Then it hit me..Sarah! The precedent has already been established. Obama did it and said the recipients had no legal right to object (e.g. see Minnesota). Yep, because once here they are free to move about the country. Anybody who does not believe the demonrats have a plan to transplant them to red states is an idiot. Let’s face it, the rats are much better at these games than we are. Agreed, and this is the second of these policy statements, and includes procedural points, for implementation. Bad news for Rat Sanctuary cities. The Mayor of Seattle says that she would welcome the illegal aliens. Send 15,000 per month, no money and allow her wish to come true. Agree. Better yet, return them directly to Honduras and El Salvador from where most of the invaders hail. Trump needs to finally use his emergency powers to put these invaders on packed charter or military flights the same day they arrive. Agree. Its a plan for failure. This must be done. If Trump backs off nww it will hurt him.Border communities are over run with parasites. They are calling for help. This is NOT illegal!! It is done all the Time. They stuck thousands on incompatible Somalis in Michigan and Minnesota at government expense. It is FUNDED . DO IT DO IT DO IT. Give then $10 and a roll of toilet paper and send 100,000 to san fagsiko. Yes!! Send them back to Mexico or Honduras or Venezuela (at least within swimming distance). 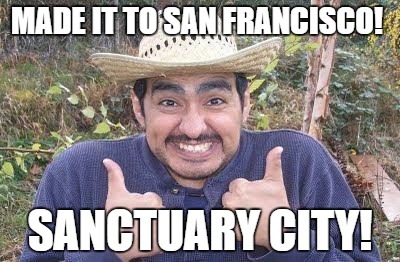 Putting illegal alien invaders in a sanctuary shithole only makes a bigger shithole spreading the disease of Demonicrat treason throughout the United States. That’s even better. C-17s can hold lots of them.